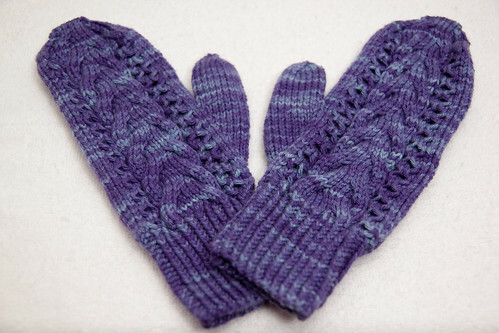 It’s Friday and I have my first FO of 2012 to share! Notes: Followed the pattern and made no changes. Well written pattern that I enjoyed knitting. Especially enjoyed the yarn! I really need to do a post of my current projects, but I feel like every time I want to blog, I end up not getting to it, then the projects all look different or I’m working on different things that I don’t have pictures of. Doesn’t help that it’s difficult to get photographs of my current projects because it’s dark out by the time I get home. This week I’ve mostly been working on a hat for Matt’s brother, Andrew. Around Christmas he asked me if I could make him a hat in dark colors. How could I say no? I went out to the LYS as soon as I could to get a nice washable wool in dark colors. 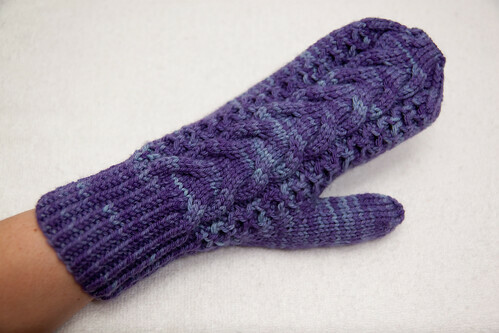 Once the Wood Hollow mittens were finished, I cast on for Turn A Square by Jared Flood. 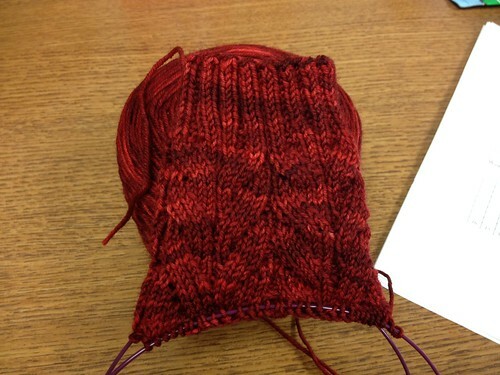 I lengthened the ribbing, but thinking I should have made it even longer so it could fold over. I was a bit worried about having enough yarn, so I stopped after 20 rows. Now I feel like it definitely needs more ribbing and I will be ripping back tonight and adding more ribbing. If I run out, I’ll just use more blue at the top. I’m using Liberty Wool from Classic Elite. It’s really soft! I’d knit a sweater out of this if I didn’t have multiple sweater sets in my stash to get through first. I’ve been working on a pair of Endpaper Mitts on and off since December. They require a lot of concentration when I work on them, so they’re progressing very slowly, but I do love the colors I’m using. The yarn is Yarntini from the semi-soild sock club she did a while back. I though the purple and green made a great combination for these. I ripped out the Legwarmer Socks again and will be restarting them in 2×2 ribbing. I didn’t like the 1×1 rib and how stretched out it looked. 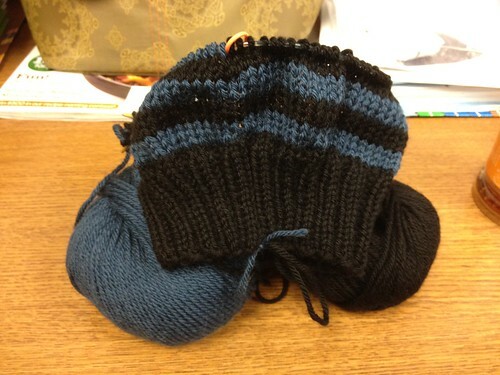 The Cadence Socks are moving along nicely, but have been set aside for the moment so I can get the hat done. Here’s a not so great phone picture of my progress on them. I’m a little further along then the picture shows. 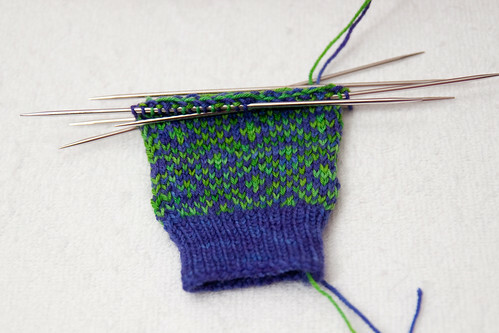 I think I have one more repeat of Chart C before I start the heel. I think it’s been a while since I mentioned Estelle. After finishing the first sleeve and half of the second, I’ve decided to frog it. 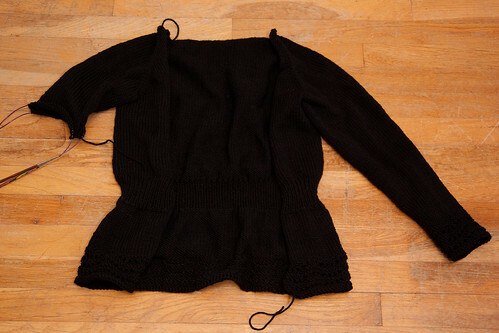 The sleeves are just too narrow for my liking and I really don’t think that blocking will fix this. Planning on frogging it this weekend and will be casting on for Aereon sometime soon. Here’s what it looks like currently.